Prospective pet owners and policy makers would like to be able to predict future behavior of dogs in order to choose appropriate companion dogs and to anticipate problematic behaviours such as aggression toward humans. Such predictions are commonly made based on presumed breed characteristics, both in the case of purebred and mixed-breed dogs. These prediction rest on three main assumption: that dogs are readily identifiable as members of a particular breed; that behavior can be reliably predicted according to breed; and that the behaviors associated with specific breeds are relevant to the contemporary function of most domestic dogs as companions for human families. 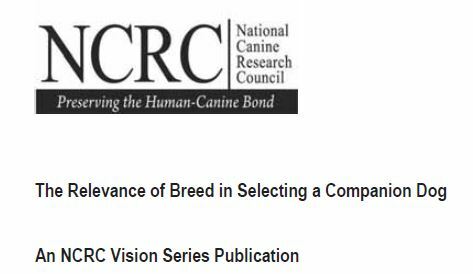 The purpose of this paper is to examine these assumptions in order to determine whether a breed label is a useful indicator of the suitability of a companion dog. Identifying the breed of individual dogs presents many difficulties. A majority of dogs in the United States, including many of those awaiting rehoming in shelters or with rescue organizations, are of mixed-breed ancestry. Visual breed identification of these dogs has been shown to be extremely unreliable when compared to DNA analyses. When adoption agency personnel were asked to list the various breeds they thought comprised a dog’s background, they were only able to include the actual predominant breed for one dog in four. What’s more, these observers often did not agree with one another’s identifications.